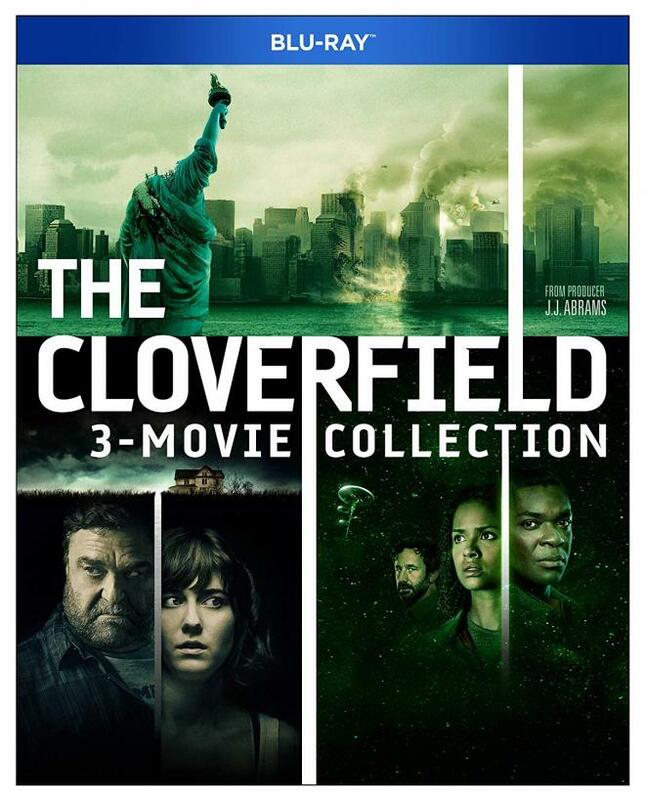 Now you can watch the engrossing Cloverfield 3-Movie Collection in one long marathon collecting the same previously issued Cloverfield and 10 Cloverfield Lane Blu-rays along with the new Blu-ray release of The Cloverfield Paradox. While the first two discs are identical to the previous Blu releases that offered decent 1080p presentations with strong audio mixes, Paradox sports a solid 1080p transfer and a rocking good Dolby Atmos mix! While the third film isn't the greatest, it's good pulpy sci-fi entertainment and this three-film set gives fans the complete experience. But without any new bonus features, this one really is only for those who didn't already own the first two films on Blu-ray or UHD. Worth a look. "Whatever it is, it's winning." Cloverfield was the result of brilliant marketing and smart storytelling by way of the tired found footage sub-genre. Taking cues from past great monster movies, the film becomes a tightly intimate tale of survival for a group of friends whose evening started at a party ends in a nightmare of destruction and chaos. A clever and smart take on the giant monster genre. Read M. Enois Duarte's excellent review of the 4K UHD Blu-ray release HERE. "People are strange creatures. You can't always convince them that safety is in their best interest." 10 Cloverfield Lane isn't a sequel. It isn't a prequel. It's a sidequel - a story set in the same world of the monster invasion Cloverfield but tells its own chilling and terrifyingly real-feeling tale of survival about a young woman abducted by a madman and held captive in his bunker. Monster movie + domestic thriller = one of the most terrifyingly suspenseful sci-fi films! Read M. Enois Duarte's excellent review of the 4K UHD Blu-ray release HERE. 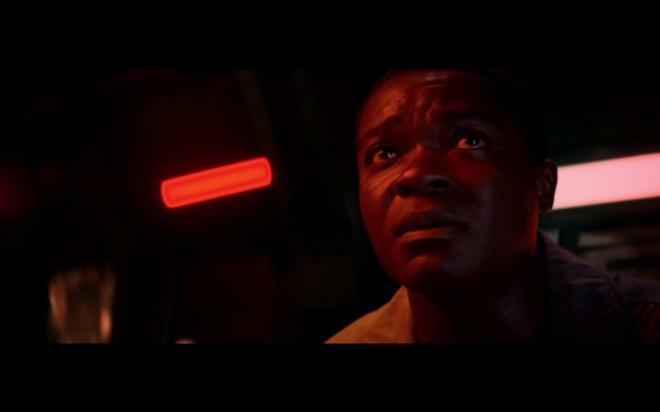 The Cloverfield Paradox lives up to its name by paradoxically attempting to explain the events of the previous two films while also leaving enough mystery for further adventures. Solving the mystery is one thing, but doing in such a way that doesn't really explain things in a way that makes much sense. It's an odd blend of elements that a great cast can't quite overcome the plot shortfalls. There's fun to be had, but not the thrills and chills of previous films. Read Matthew Hartman's review of the Blu-ray release HERE. 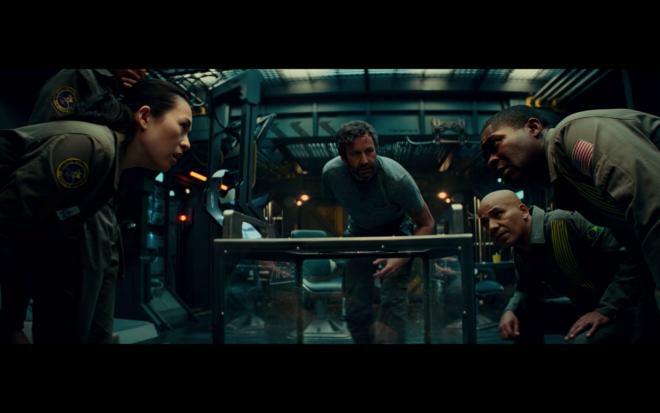 An uneven trilogy of loosely connected science fiction films comes together in The Cloverfield 3-Movie Collection. While Cloverfield and 10 Cloverfield Lane have been on the Blu-ray market for years and enjoyed satisfying 4K upgrades, The Cloverfield Paradox is only given a Blu-ray release - even though it was shot on 35mm and finished at a native 4K digital intermediate and streamed on Netflix with Dolby Vision HDR - making this Blu-ray collection a bit of a question mark for fans. If you didn't pick up the earlier films on Blu-ray and you're not on the 4K UHD bandwagon yet, this set offers up the whole collection in one nice and tidy package. While the first two films are easily the best, the third is an entertaining little piece of sci-fi hokum that had good intentions but doesn't quite fit in neatly with the other two films. There are some cool callbacks and some nods to the first two films that make it worth watching. 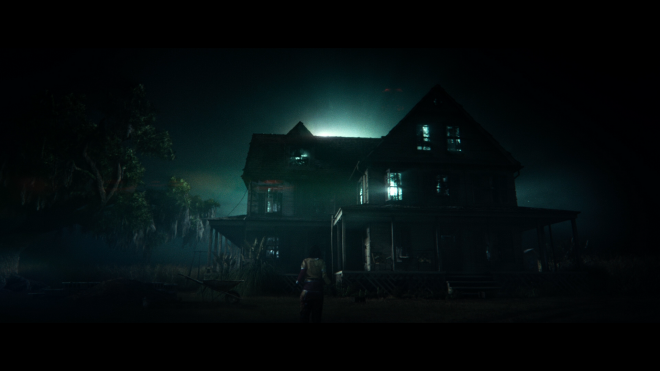 Will there be another Cloverfield? Probably…maybe? An IMDB search indicates one is under development, but that doesn't mean much. If Paradox is the end of the franchise, it's a bit of a bummer note to go out on considering how much potential for universe building and genre mashups this series had to offer. That said, at least the first two films are excellent popcorn munching science fiction fun and this 3-Movie collection brings everything together in a nice neat little package. 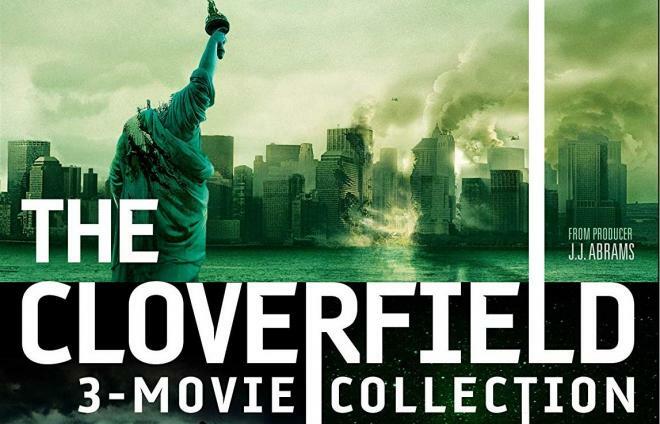 Paramount Pictures frees The Cloverfield 3-Movie Collection onto Blu-ray in a 3-Disc Blu-ray collection. Cloverfield and 10 Cloverfield Lane are the exact same Blu-ray discs that were issued during their initial release and subsequent 4K UHD releases. Nothing new there. All three discs are housed in a sturdy 3-Disc case with each disc getting their own tray and are not stacked on top of one another. Each disc loads to their own respective main menu with standard navigation options. No additional DVD copies of the films or digital redemption slips were included. As the discs for Cloverfield and 10 Cloverfield Lane are the exact same, I'll refer back to our original Blu-ray reviews for those discs while taking note of their respective upgrades on 4K UHD. The scorecard is an average of all three Blu-ray presentations. When originally released in 2008, we didn't know what to expect. Another 28 Days Later? 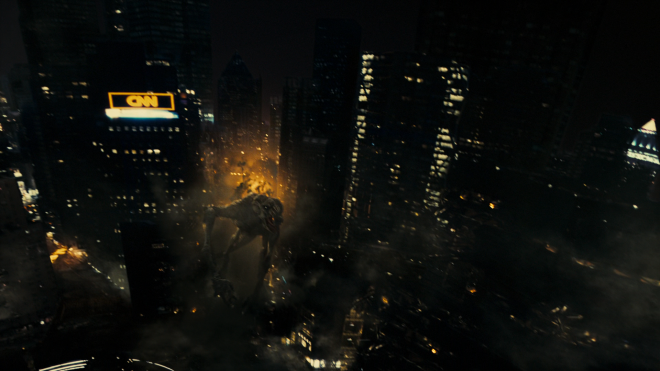 Thankfully Cloverfield offered a marked improvement over its DVD counterpart and gave fans a number of visual improvements - even through the found-footage styled image wasn't comparable to modern glitzy releases. While clarity didn't improve with a 4K UHD release, the Dolby Vision HDR offered a notable uptick in color, black levels, and removed the unsightly blooming quality. While an excellent looking film with a vastly different visual style than its predecessor, it, unfortunately, suffered from some baked in judder while displaying some unfortunate aliasing. A bit of banding, some extra noise, and softer than ideal black levels left the 1080p Blu-ray looking a tad bit on the murky side of pristine. Thankfully, the 4K UHD presentation was able to fix some of these issues, improving some detail, black levels, contrast, but some slight noise and aliasing remained. Will this here is the odd outlier of the bunch. Originally released on Netflix in 1080p with Dolby Vision HDR, this native 4K finished film is given only a 1080p Blu-ray release that is a little bit of a step back from it's streaming counterpart. While the image offers up great detail levels and the presence of fine film grain gives the image a classy filmic appearance, the loss of Dolby Vision is notable. Black levels just aren't as crisp and the film's stylized color scheme just doesn't pop as it did in streaming. For standard Blu-ray, this is probably the best looking of the bunch, but the lack of a proper 4K UHD Blu-ray is a shame. Likewise, with the audio nothing has changed for these Blu-rays of Cloverfield and 10 Cloverfield Lane. The scorecard is an average of all three Blu-ray audio tracks. This flick enjoyed a terrific Dolby TrueHD release on Blu-ray that earned full marks - and it was so good we maintained its 5-Star rating for the 4K UHD Blu-ray release. It's active, there's plenty of surround effects, and when those creatures start ripping apart New York, you feel like you're smack dab in the middle of it. Like the first film, this Blu-ray's Dolby Atmos audio mix was practically pitch perfect with terrific subtle use of object-focused sound design - so good they used it again for the 4K UHD Blu-ray. Considering the confined space the film takes place in the sound field could feel a tad narrow at times, but that's more of a gripe than a technical shortfall. Netflix originally offered this film with Atmos on certain XBox and LG devices. And while the number of supported devices has grown, with a physical media disc, you don't have to worry about compatibility. If you have Atmos at home - you actually get this thunderingly effective, active, and damn moody Atmos track! It's a dynamic mix with plenty of activity and it's nice to have it on a disc that everyone can enjoy. For as much fun as these flicks are and the fervent fan following, the bonus features package for each film has been rather hit or miss. While the Audio commentaries for Cloverfield and 10 Cloverfield Lane are pretty great, the supplemental featurettes don't really do a whole hell of a lot. There is some decent behind stuff, but a lot of it is the traditional talking head canned EPK variety. Taken as a whole, The Cloverfield 3-Movie Collection represents a bit of a mixed bag. While it features the two excellent first films, the third outing is a frustrating entry that probably would have worked better if it hadn't been smashed into a franchise it didn't originally belong to. Like the quality of the films, the included Blu-rays represent the best and worst. Failing to deliver Paradox on 4K UHD, Paramount has opted to repackage the previous two film's respective Blu-rays with the third film. While the transfer for the first two are decent enough on Blu-ray - we've already seen the improvements the 4K UHD Blu-ray releases could offer. If you're not 4K ready, this isn't a half-bad set and allows you to neatly own all three films in a tight and tidy package. But if you've upgraded to 4K or are about - you're better off buying The Cloverfield Paradox on its own. It's a solid set, but really it's only for those fans who don't already own the first two films. Worth a Look.